WeddingWire is one of the largest and most trusted online wedding marketplaces that connects engaged couples with local wedding professionals. Couples from all over the world can search, compare, and purchase services from a directory of 500,000+ vendors on WeddingWire. 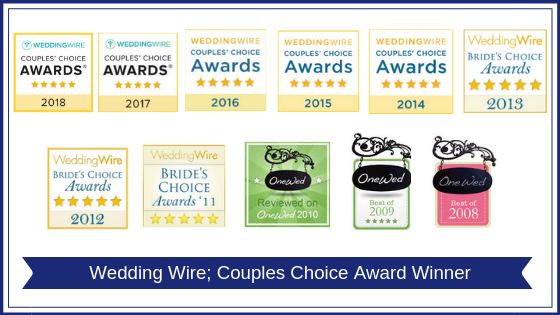 Create Excitement has had the the honor and prestige of receiving The WeddingWire Couples’ Choice Awards® for excellence within our industry for the last 12-years. Winners are chosen by reviews received from more than one million WeddingWire engaged couples throughout the United States. Weddings and Other Events in New Jersey and Beyond! By establishing a true personal connection with each of our wedding clients, Create Excitement goes to great lengths to listen to our client’s desires, and immerse ourselves in their vision, understand their wants, their hopes and dreams; we then create an individual and all-encompassing experience coupled with exemplary service and superior execution. Winning The WeddingWire Couples’ Choice Awards® for so many years is both humbling and gratifying. So, thank you to all our clients who over the past 12-years have allowed the team at Create Excitement to be a part of your wedding day. We look forward to many more years of proudly serving the Northern New Jersey area and beyond with professional DJ Entertainment Services.